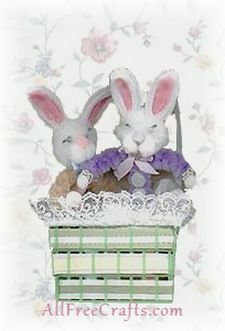 An Easter craft project showing how to make an Easter basket from a recycled berry basket. We also have another version of the Easter Berry Basket to show you; just pick whichever one you like the best to make for yourself. 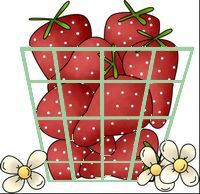 Decide where the back of your basket will be and start and end your ribbon weaving at the back of your basket. To weave the ribbon through your basket, simply insert the ribbon in and out of each strip along a straight row, as shown in our photo. You can use several small ribbons or a few larger ribbons or as I did, use a large ribbon first and then on top of the larger ribbon (only on the top and bottom weave), I inserted a smaller ribbon by weaving under the basket slots, but on top of the ribbon. To secure your ribbon, glue the ends together neatly. One chenille stem was not long enough for a handle, so I used two, twisting the two ends together and securing to the top rim of the basket sides with a couple of twists. I had to cut a little off of both ends of the chenille stems to get the length that I wanted, but I kept the joining twist at the top centre of the handle. The twist is covered with a small bow tied around the handle. If you prefer, you can use paper twist for the handle, but securing it with hot glue won’t give you as much strength as you may need, so I recommend the chenille stems. I didn’t like the twist of the chenille stem handle at the top rim of the basket, so I added a strip of stiff lace around the top to cover it. Simply glue the scrap of lace around the top rim. This covered up the twist nicely and is quite pretty. Instead of the lace, you can simply tie a bow at the bottom of each handle to cover the twist around the top of the basket.